It happens only every four years! Here's a cheerful way to celebrate the extra day we've been given this year. Ladybugs want to be part of the fun too! The flowers complimented the table and the outdoor venue. This table looked glorious outside. Anyone who knows me knows I LOVE red glassware. Actually I love all colored glassware. So what should I serve for lunch? Any ideas? Please don't say "frogs legs". I couldn't do that! I'm thinking a bacon, basil and tomato sandwich with a delicious salad of artisan greens, fruits and nuts, or a pasta salad with a kick, accompanied by my new favorite beverage Sanpelagrino Limonata spiked with strawberries! In the sherbet glasses I believe lemon sorbet topped with mixed berries would be a refreshing conclusion to the lunch. 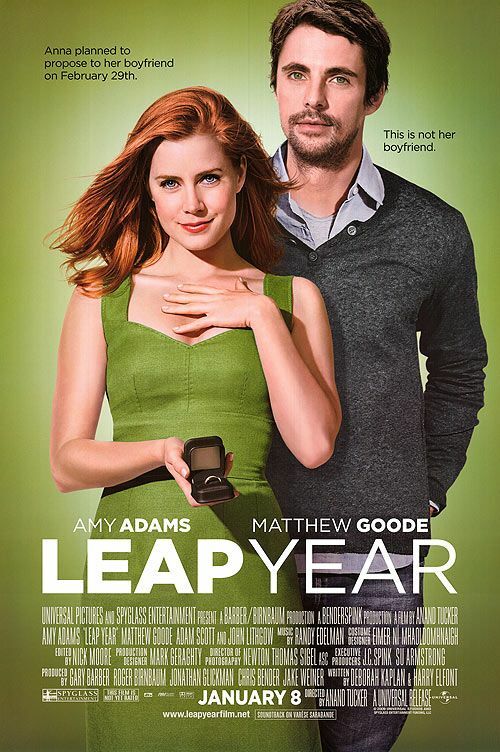 If you haven't seen this movie and you love Rom-Coms like I do, you must view this movie before or on February 29th.